The new GorillaTrades app is now available on the Apple store, giving subscribers full access to the entire subscriber’s area of the website on their iPhone. The GorillaTrades portfolio search is the newest feature on the GorillaTrades website, and is now available instantly within the app. The GorillaTrades portfolio search feature provides subscribers with potential stock picks based on their personal search criteria, such as desired risk and price levels. The Gorilla’s latest email, including The Gorilla’s daily commentary is instantly available within the app as well. 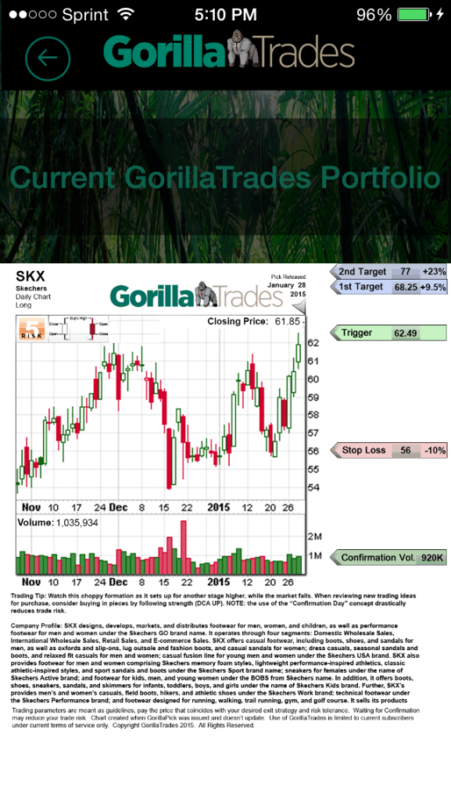 The GorillaTrades app also gives each subscriber full access to any new potential picks, as well as a chart of any existing or potential pick, the GorillaTrades portfolio, GorillaPicklets (small cap) portfolio, the Option Idea of The Week, and much more.